Travelling the winding road from Dunbeath will bring you to the scattered houses of Braemore. It is surrounded by hills and overlooked by Maiden Pap. 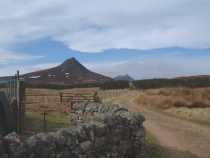 These pictures Taken near the site where it is thought Loch More Castle may have been. The History of Caithness by J T Calder mentions a castle built by Sir Reginald de Cheyne. It is supposed to have been where the River Thurso flows from Loch More. The legend of the time suggests Sir Richard had invented a contraption to trap salmon as they emerged from the loch to the river. A bell is supposed to have rung in the castle when a fish was trapped. Fresh fish on tap. No wonder they were so healthy in Caithness back then.